We have completed PMA projects for more than 20 airline customers, and have tested data for more than 1,200 panel configurations. Our three FAA Designated Manufacturing Inspection Representatives (DMIR) meet continuing education requirements to stay up-to-date on the most current regulations. 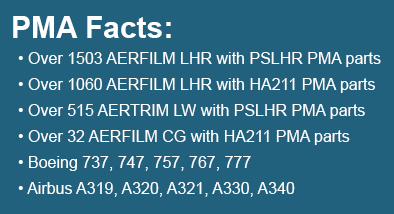 For airline rebranding and refurbishment projects, Schneller is authorized to issue FAA Form 8130-3 Airworthiness Approval Tags for PMA-eligible parts to show compliance with FAA, EASA, and other international flammability, smoke, and toxicity requirements. This is necessary to avoid repercussions by local airworthiness authorities and retain the ability to return the aircraft at the end of a lease or resell the aircraft. To contact Schneller's Certification Services department, fill out our Certification Services Contact Form.